CHYPRE – Idalion- The Lycoming College Archaeology Program has announced its completion of the 2012 expedition of Idalion, Cyprus. Dr. Pamela Gaber, professor of archaeology and Judaic studies and director of Lycoming's field school, led the project from June 25- Aug. 10. According to Gaber, students explored the Adonis Sacred Grove on the shoulder of the East Acropolis of ancient Idalion, Mouti tou Arvili. During the expedition, founding levels of some of the earliest structures in the six-hectare sanctuary were reached upon the bedrock. Findings showed that pits were cut in the original rock of the hill, and the earliest walls, which date to the 11th century BCE, were laid upon it. This earliest level of the sanctuary most closely resembles the sanctuary to the Great Goddess on the top of the acropolis of ancient Amathus. Another find occurred when the group explored an ancient road from Idalion to Kition, where the main gat of the ancient city was found. It was destroyed during renovation of the road. Only the socket for the gate pivot was visible among the bulldozed area, and in undertaking a dig across the road, two walls were revealed. One of the walls could be dated back to the Hellenistic and Roman period, while the other was dated much earlier, probably the 6th century BCE. Work also continued in the Sanctuary of the Paired Deities below the west acropolis administrative center. The earliest material yet was found in this area, which was the central place of worship of ancient Idalion. It was there that one of the most interesting finds was discovered under a pair of standing stones. The stones appear to have been continually revered from the 5th century BCE to the Roman period. This year's dig revealed that they were set up atop a platform on which two wooden pillars stood. These seem to have been burnt completely around 450 BCE, the same time the Phoenicians destroyed—and later rebuilt—the administrative complex just south of the Temple. It is possible that these objects of worship were burnt as part of the conquest in order to establish the new rule of the people from Kition over the Cypriotes of Idalion. Next year, the expedition hopes to pursue the fascinating early history of the ancient city-kingdom of Idalion. "We will continue working in the Sanctuary of the Paired Deities, in the Adonis Temenos, and in the industrial area below the East Acropolis," says Gaber. "All of our work is undertaken with deep gratitude to the Department of Antiquities of Cyprus, and with the support of the Cyprus American Archaeological Research Institute." VIET NAM – Bach Dang River - A grandson of Genghis Khan, Kublai's realm stretched from the Pacific Ocean to the Black Sea, covering a fifth of the known world. In 1279, he became the first non-Chinese emperor, establishing the Yuan Dynasty and ruling over China, present-day Mongolia, Korea and other Asian regions. But his ambition to occupy more lands led to one of his worst defeats when he sent his warships to invade Vietnam in 1288. 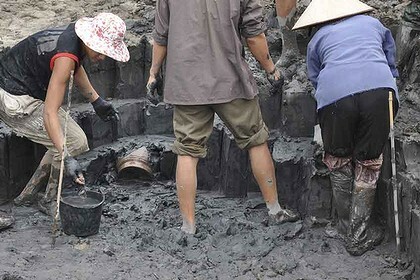 Now, 725 years later, Australian archaeologists are helping excavate the site where the mighty Kublai Khan's invasion fleet of 400 was destroyed by the Vietnamese. They had lured the Mongols up the Bach Dang River just as the tide was starting to ebb. The Vietnam army had driven hundreds of sharpened wooden stakes into the bed of the river that were invisible at high tide; when the tide turned and began to ebb, the entire fleet was holed and sunk, captured or burnt by fire arrows. 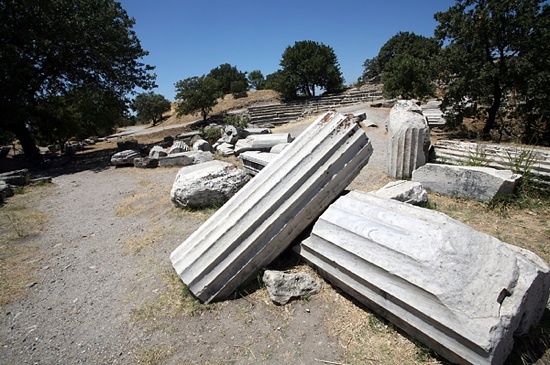 TURQUIE – Troy - The ruins of ancient Troy will be examined by a cross-disciplinary team of scientists in an expedition led by UW-Madison classics professor William Aylward. Troy, the palatial city of prehistory, sacked by the Greeks through trickery and a fabled wooden horse, will be excavated anew beginning in 2013 by a cross-disciplinary team of archaeologists and other scientists, it was announced today (Monday, Oct. 15). Troy and the Trojan War were immortalized in Homer's epic poem the Iliad centuries after the supposed events of the conflict. The site was occupied almost continuously for about 4,500 years, from the beginning of the Bronze Age to the 13th century A.D., when it was abandoned and consigned to myth. It was rediscovered in the 1870s by the wealthy German businessman and pioneering archaeologist Heinrich Schliemann whose work at Troy laid the foundations for modern archaeology. The site of Troy is in modern Turkey and is situated on the Dardanelles, a crossroads between East and West and a flashpoint for conflict in both ancient and modern times. The archaeological site is a complex layer cake of history and prehistory, with 10 cities superimposed one atop the other, some with clear evidence for violent destruction. Following the demise of Troy at the end of the Bronze Age, the site was re-settled by Greeks, Romans and others, who all claimed Homer's Troy and its cast of characters — Achilles, Helen, Patroclus, Priam and Ajax — as their own cultural heritage. The ancient city was visited by the Persian general Xerxes, Alexander the Great, and Roman emperors, including Augustus and Hadrian. Homer's epic poems about a lost age of heroes and the legendary Trojan War have endured as sources of inspiration for art and literature ever since. TURQUIE – Hattuşa - Istanbul’s Yapı Kredi Cultural Center has opened a new exhibition on Hattuşa, inviting viewers to dig through the history of the past 100 years of archaeological excavations at the ancient Hittite capital in northern Turkey. The unpublished photographs that form the backbone of the show were gathered with the aim of painting a historical, ethnographical and sociological panorama of the whole excavations process from 1906 to 2012. The name of the Hittites, who established a great empire in Central Anatolia in the second millennium B.C., was almost completely erased from the memory of humanity because their name did not appear in sacred books unlike many civilizations of the ancient Near East. The civilization was partly rediscovered by French researcher Charles Texier, who came to Boğazköy in 1834, publishing the results of the first explorations there in 1839. The plans and drawings in that publication elicited great interest in the archaeological world. Many explorers and scientists came to Boğazköy for investigations in the 19th century. 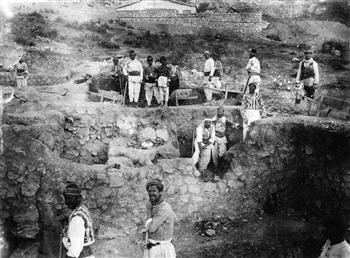 During these investigations, the first plans of the city were drawn, the first photographs of Boğazköy and Yazılıkaya were taken and several small-scale areas were excavated. Cuneiform tablet fragments, which were sporadically found and brought to Müze-i Hümayun (Royal Museum), as well as the discovery of rock reliefs in Yazılıkaya that were unlike anything known until then, established the existence of an important culture at Boğazköy. The first traces of settlement in the area of Hattuşa, which has been continuously settled since its founding are in the form of small, short-lived village settlements that are found in the areas around Yarıkkaya, Büyükkaya and Çamlıbel Tarlası. Although the rocky, steep hills of the area seem unsuitable for settlement, the location – which is sheltered by deep valleys on either side and with many natural water sources –played an important role in the long urban development of Hattuşa. In its northern reaches, the city included a settlement of Assyrian merchants from northern Mesopotamia in the 19th and 18th centuries B.C. It developed like many other Bronze Age cities and shows oft-found characteristics in its architecture and urban layout. The name “Hattush,” which means “silver” in Sumerian, is encountered on cuneiform documents for the first time in this period. The name of the city is thought to be probably associated with silver trade.